Even while we were doing the background score for Roja, he’d started composing the music for this film. He’d already worked on the first song— Kannum kannum. We were getting completely out of the Roja zone. This was much wilder, much bigger. Veerapandi kottaiyile went all over the place. The songs were elaborate pieces, and he’d take quite a bit of effort to get each piece done. It was not done in a hurry. It was done to near-perfection. For the Chandralekha song, he wanted to record a piece. He said, ‘If I play it as a tune, it will be nothing.’ We didn’t have any lyrics. We wrote some lyrics, then and there, in English, and we got the singer to sing a one-minute version of the song. That became the composition. Each song was different. In Raasathi, he wanted no instruments, only vocals. The more varied it was, the wilder it was; it started fitting into the film— because there was nothing straight about the film. It has been 20 years since the world of Indian Film Music was shaken to its roots by A.R.Rahman’s Thiruda Thiruda. It triggered a tremor and it’s after effects are still felt in Indian film music. The freshness, the energy, the lunacy, the innovation and experimentation in Thiruda Thiruda music still remains an unparalleled achievement in Indian film music. Last month, on a weekend trip from Bangalore to Salem, I was listening to Thiruda Thiruda songs on CD in the Car Stereo System for the first time, and after one round of listening, I tweeted - “GREATEST MOVIE SOUNDTRACK EVER. PERIOD” and It is. When I first heard Thiruda Thiruda songs, I was 9 years old; I didn’t know Michael Jackson’s music, I hadn’t heard Rock Music, and I wasn’t conscious listener of Ilaiyaraaja’s music though it was always in the air everywhere, never heard of Western Classical Music or knew of a genre called a acapella – Thiruda Thiruda music affected me in ways I cannot even begin to explain. Now, I know a little of all those musicians and their music and musical genres and I am still as affected by Thiruda Thiruda Music. What Thiruda Thiruda music was when it first released to any discerning music listener is what it is and what it always would be. It is something that happens once in a lifetime of a composer’s career and it is all the more astonishing that it happened so early in case of A.R.Rahman. There is no point discussing the technicalities and doing analysis on the Thiruda Thiruda music, experience the music if you haven’t yet - The Playlist. Then, there is the equally breathtaking background score. And his background score was outstanding. He really worked on it. It was a big John Williams kind of score. We wanted it mastered in digital, 5.1 and all that, but we were not yet into DTS at that point. That’s when technology was changing. When he started doing Roja, we still used to record on half-inch tape. For this, maybe we used ADAT, a tape format that could record eight tracks of digital audio simultaneously. So with each film, the technology was jumping by leaps and bounds. And each time, he was there, on the ball, ready, ahead of his time, waiting for the technology to land where he wanted it to. He came in at the right time, when his every wish was coming true. And it’s still coming true. The regular method of following the characters, recurring situations with motifs are all there, but no one of them Sounds like what we had heard before. There are strings, orchestral outbursts but the mix of Synth and Acoustic instruments made it sound grander and unique. When recently Rahman was asked about which score he would record again, now that he has access to all the Symphony Orchestras in the world, he said, “Thiruda Thiruda”. That would sound great, but the uniqueness of the sound of the score in the film as it was comes from heavy Synth dosage in the mix. The chase theme from Thiruda Thiruda was played in the end credits of the television broadcast of the first ever GIMA – "Global Indian Music Awards", which is primarily an award instituted to recognize the best of Hindi film music every year. Thiruda Thiruda is a Tamil film. It was not even dubbed in Hindi. Only the music was released in Hindi, but I don’t think the theme was included in that Cassette. It is one of those pieces of music, like one of Yanni’s, like Mozart’s 25th, like Beethoven’s 9th - without you knowing who the composer is and when it was composed, it enters into life of every living being that has ever heard any piece of music. Thiruda Thiruda main Chase Theme is that last piece of an Instrumental music a Music Shop guy picks to fill in the left out tape space while recording songs in T-60 or T-90 cassettes, and whoever listens to the cassette would be hooked by the piece even though they don’t know who, what, where or how about the piece. Never before we have seen a train heist episode in a film, backed by Rock guitars - the ones that actually sounded like rock guitars. The story suddenly shifts from City to Village, the first strain of music we hear is a distant voice (A.R.Rahman’s) singing a sombre tune Rasathi – we usually hear a pleasant flute when a story suddenly cuts to a Village from City. Thiruda Thiruda is packed full with action and chasing sequences. A.R.Rahman’s orchestral arrangements for the chase sequences, with swelling string section, would conveniently fit in any Hollywood action film that he might compose music for in the near future. How do you score the umpteen numbers of chase sequences in the film differently, without any of it getting monotonous and yet maintaining a thematic integrity? Each chase sequence has a distinct music cue, but the one that stood the test of time is what we now call the “Thiruda Thiruda” theme and it plays when for the first time in the film Kathir (Anand) and Azhaghu (Prasanth) chase others to rescue Rasathi (Heera), instead of them being chased by others, and its reprise is again when they chase the Villain gang to rescue Chandralekha. The score for Dishoom-Dishoom action sequences in the Indian films are most repetitive, uninspiring pieces of music you could ever hear – but not in here, Rahman plays fiddle in one (Cue_20) and another is laced with Mirudangam (Cue_36) throughout. Aathukkula Aira meenu song (Cue_34), which plays when villagers use the wild elephants to lift the Container Lorry out of the river, is a folksy little beauty amid high adrenaline action music. Then there is that freaking collage of samples and sound fonts in the wicked villain theme. Even that computer access card gets a four-note motif that recurs whenever it passes hands in the course of the film. There is a little love theme (Cue_22) also. There is a piece with counterpoint (Cue_29) too - when Kathir asks Rasathi to marry his brother who is also in love with her, a hint of love theme on Piano is played as a counterpoint to the melody of the song Rasathi (this version sung by Srinivas). A.R.Rahman pulled all the stops, not just in the songs, but also in the background score of the film. Folk, Rock, Synth, Voice and Sound Samples, Ambient, Orchestral, Filmy and many more that I cannot name – assortment of genres all in one score - Total Madness! Never before I had heard such distinct music cues in the background score of one film. Thiruda Thiruda background score is full on Rahmanathon. I hope someday A.R.Rahman officially releases these cues on a CD in High quality. From my "Memoirs of a Rahmaniac"
I was attending private home tuition classes at my Class Teacher‘s (Bharathi Miss) house every evening after the regular school hours. They had a high-end music system, the biggest I had seen and best I had heard until then. It is in their house I first heard the Thiruda Thiruda songs. The music system was kept in a room next to the living room, and from where I sat I could clearly listen to the songs when they played them from inside the room. 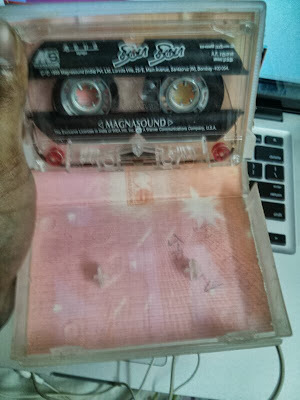 I saw the lyrics booklet (a first time for a Tamil movie soundtrack, I guess) that came with a nicely designed Thiruda Thiruda audio cassette box. I use to hide the lyrics booklet within my text book that I would be pretending to read. I would read the lyrics booklet, whenever I heard a song from Thiruda Thiruda being played in the other room. It was difficult to decipher the lyrics otherwise. I was yet to get used to the dense layers of instruments amidst which AR Rahman drowned his vocals in the songs. Ironically, there is in the same soundtrack an acapella song Raasaaththi – first ever in Tamil film music or probably even Indian film music. However, Veerapandi Kottaiyilae was the song that hit me like a thunderbolt. I could not believe what I was listening to. I could not understand anything, but I was wonderstruck by the energy of the beats and the unending twists and turns in the structure of the song. Awesome soundtrack!! score is ultimate and fresh till date!! Karan - Thanks for the link. I saw this interview long back. Now, have embedded the portion where Amit talks about Thiruda Thiruda and A.R.Rahman in the post. Just listened to Thiruda Thiruda after watching 'How to train your dragon'. I can't imagine a better song befitting the Night Fury in the movie than 'Chandralekha'. The song soars and strikes just like the dragon! I am curious if you heard it for the first time in the year of its release or later. I think I watched the film in 93 itself, but not sure. I was 8 then and can't give an opinion on the film because I haven't seen it again since. I remember my amma and chitthi saying it had a disappointing finish. But I think we all loved the music. It was such an exciting phase - Gentleman, Kadhalan, Thiruda, Bombay, Duet...the classics just kept rolling. Madhan - I clearly remember that I watched the movie the week it released in theatres. My uncle took me and my brother for the movie. Around the same time, heard the songs too. Thanks also to Sun TV. A.R. Rehman is a fabulous musician and gives too good music to lyrics. Saw this movie in 93(Urvashi-Bangalore), Film was So So. But freaked out on ARR's Score. Only in Bangalore the Movie ran for more than 100 days it seems..!! Wondering whether you can provide a DL link like Sri Rama Rajyam.